George Frederick Boyle’s music is a rapturous outpouring with motives clambering over themselves, questing for utterance. A protégé of Busoni, in his era he was recognised as a significant musical figure, so how can it be that he is almost completely forgotten today? Boyle came to the attention of Ignacy Jan Paderewski as an 18 year old while Paderewski was touring Australia as a piano soloist with the Hambourg Brothers. On Paderewski’s advice he was whisked off to lessons with the great Busoni who went on to become his mentor and collaborator. Busoni quickly came to call on Boyle to deputise for him on his busy tour schedule. The legacy of Boyle’s keyboard fireworks and the fertility of his imagination come down to us through his piano music. The high romantic ethos that he embraced coupled with the influence of Busoni’s breathtaking approach to the keyboard shine through in Boyle's music, in works that offers a window to his verdant creative soul and prodigious technical capabilities. Boyle avoided making recordings in the active part of his career, focussing instead on committing a range of his performances to the rolls of the Welte-Mignon and Deluxe Reproducing Roll Corporation pianos. In the later part of his career he devoted himself to teaching, heading the piano schools at the Peabody and Curtis Institutes . George Frederick Boyle grew to be a pillar of a great American piano tradition. As a 24 year old he replaced fellow Australian Ernest Hutchinson as professorial head of Piano studies at the Peabody Institute in Baltimore, later was chosen as the foundation piano teacher at the Curtis Institute of Music and later again, he formed his own piano institute that came to be associated with the Julliard School of Music. Ballade is one of Boyle’s most effective solo piano pieces and a great introduction to his rapturous style. The Ballade’s impressive edifice is a powerful statement in the great romantic keyboard tradition. Boyle’s epic Sonata for Piano is his largest scale solo piano work. All of the characteristics of his composition, the outpouring of melodic invention, his improvisatory approach to form and the restless romantic spirit bursting from the keyboard, are all evident in abundance. If there are echoes of Liszt’s great B minor sonata in this piece it is not coincidental. Liszt’s great sonata was a work in which Boyle’s performance was regarded as unsurpassed. The Five Piano Pieces are sparkling and innocent miniatures alive with Boyle’s melodic invention but this time in a vein to delight rather than amaze. Each piece is an exquisite example of musical picture painting and each is dedicated to one of his close friends. 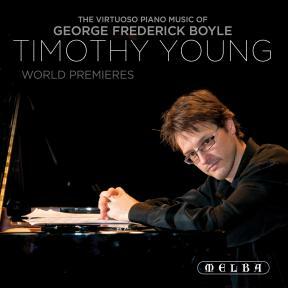 The Virtuoso Piano Music of George Frederick Boyle is Timothy Young’s debut solo CD on Melba Recordings. Young is highly respected as a collaborative musician and has previously appeared on Melba Recordings CDs with Ray Chen, Roger Benedict, Cheryl Barker and Ensemble Liaison, of which he is a founding member. This recording is the fruit of Young’s passion for research into the life and music of George Frederick Boyle. Boyle was also a prolific composer. His output comprises nine orchestral works, an opera, The Black Rose, eight chamber works, in excess of 70 piano pieces, and more than 30 vocal compositions. He wrote in a romantic style in which melody was paramount, couched in lush and innovative harmonies, with a unique logic and organic unity underpinning scintillating rhythms. His music is characterised by passionate spontaneity and a pursuit of expressive freedom that refuses to be constrained by any formal structural criteria. This compelling workmanship is made all the more extraordinary by the fact that he was largely self-taught. Perhaps his relative obscurity today owes something to his reluctance to make commercial recordings. But we are fortunate to have a number of his performances (both his own compositions and those by others) on piano rolls. Made for Welte-Mignon and the Deluxe Reproducing Roll Corporation, they provide ample evidence of his gifts as a pianist. Boyle devoted most of his later life to teaching, and was esteemed for his comprehensive pedagogical lecture recitals. His insightful essays on piano technique and interpretation for Etude magazine in the late 1920s reveal an open, unbiased approach that refused to blindly adhere to one pianistic school or another. In fact, one is reminded frequently of another great teacher of the time, Heinrich Neuhaus. George Frederick Boyle was born in Sydney, Australia, on 29 June 1886. His parents were professional musicians – his father a choirmaster and organist, his mother a gifted pianist and teacher. Under her guidance he received instruction from the age of five and made his first public appearance two years later. From his 14th year he began giving concerts, interspersing recitals with performances with the Sydney Choral Society, which he began to conduct at 16. In 1901 he studied with Sidney Moss in Sydney and gave a gruelling concert tour of more than 280 cities and towns in Australia and New Zealand. An invitation to tour Australia with the famous Russian brothers Mark and Boris Hambourg in 1903 followed, with life-changing consequences for the young prodigy. Touring Australia himself that same year, Ignaz Paderewski attended one of Boyle’s concerts. Impressed with his performance, the great pianist gave him some lessons and recommended he continue his studies with Ferruccio Busoni in Europe. In an article for The Musical Digest in 1925, Boyle would remember Busoni as ‘the greatest single influence to which circumstance or my own design have ever subjected me’. Boyle continued to tour and travel extensively throughout Europe during his five years studying with the great Italian master from 1905, attracting critical acclaim as an extraordinary virtuoso pianist, orchestral conductor and composer. By the time he arrived in America, he was on the brink of worldwide fame. In 1910, on Busoni’s recommendation, the 24-year-old Boyle was accepted, without being asked to audition, to replace fellow Australian Ernest Hutcheson as the professorial head of the piano department at the Peabody Institute in Baltimore. He remained there until 1922, teaching theory, composition and piano while continuing to tour the length and breadth of America (speaking later about American critics, he recalled: ‘If they liked me they would write, “Last night, George Boyle, American composer…”, and if they didn’t, “Last night, George Boyle, young Australian pianist!”’ More often than not, they liked him!). In 1927 he opened his own Boyle Piano Studios in Philadelphia and became associated with the Institute of Musical Art (later to be called the Juilliard School of Music), remaining there until 1940. From the mid-1930s, his focus shifted towards teaching, his compositions hereon in primarily devoted to didactical ends. In 1940 a stroke caused him to lose the feeling in his left arm, the near disaster averted when he trained himself to play again to the point where he was able to undertake public recitals. Although he never returned to Australia to perform, he often remarked on the similarities his native land shared with his adopted home: ‘In no two countries have I found the same ideals upheld, the same buoyancy of spirit and friendly attitude as I have in America and Australia’. He died on 20 June 1948, nine days before his 62nd birthday. Along with the Sonata (1915), this is one of Boyle’s most successful larger-scale solo piano works. The themes introduced at the beginning of the work form the basis of the entire composition, reappearing in various transformations and keys throughout. Always with an inherent logic, this rondo-like form strongly unifies the various sections and moods into what is essentially a unique improvisation in which Boyle creates a wide range of textures and pianistic colours with frequent tempo and metre changes, combined with rich and unique harmonies, dissonances and modulations. It is virtuosic piano writing, written in the late Romantic style, filled with octaves, tremolos and arpeggios, and freely expresses the full gamut of emotional expression. In 1922 Musical America magazine approvingly commented that ‘it is almost over-rich in thematic material [with] directness of beauty in the themes, flame in the surging and magnificence in climax’. Published by Carl Fischer, Inc., the Sonata brought Boyle’s list of published compositions to 60. Composed in 1915 and premiered by the composer in New York, it is Boyle’s largest solo piano work and built in powerful and epic proportions. Like the Ballade and the Piano Concerto, it develops from much of the material presented in the first subject and shares the same motive throughout its three movements. The development of this material achieves some markedly original and exceptionally beautiful textures and colours, illustrating his great understanding of the instrument’s capabilities. One can also perceive the influence of Debussy (whose Preludes Boyle introduced to American audiences in his concerts) and even, perhaps, of Liszt’s Sonata in B minor, a work he performed often and, according to many, better than anybody else at the time. The first movement begins in G sharp minor with an introduction that presents much of the thematic material. Throughout the work Boyle reveals his own impressive pianistic facility through the demands made of the performer. Essentially in sonata form, this epic movement concludes with an exciting coda in B major. The second movement is in ternary form: a reflective, world-weary contrast to the tumultuous ending of the first movement. Again, Boyle’s mastery of beautiful melody and strong emotions is manifest as this poetic movement ends in F-sharp major, preparing us for the brilliant dance-like finale that follows without interruption in B minor to introduce a number of themes in a martiallike character. There is no development as such — the themes simply return unchanged, albeit in different keys. An exciting coda brings the work to a convincing conclusion with the Maestoso theme of the entire sonata transformed. These short but masterful character pieces, beautifully written for varying levels of ability and individually dedicated to his students, came easily to Boyle’s pen. They demonstrate careful workmanship, delicacy and sincerity of musical expression, and one could unashamedly include many of them in a professional recital. This music has been unduly neglected and deserves to be heard, and I am delighted to have finally been able to shed some light on this great forgotten Australian. My gratitude goes to Grahame Code for introducing me to the works of George F. Boyle: his vast collection of piano rolls and music, alongside his enthusiastic passion and support of Australian composers of the past is a source of inspiration. Grateful thanks, also, to Irene Weiss Perry, whose comprehensive dissertation George F. Boyle: Pianist, Teacher, Composer (Peabody Institute of The John Hopkins University, 1986) was used as the basis for these notes. With thanks to Professor Ed Byrne and the Monash University Academy of Performing Arts for providing the Robert Blackwood Hall.